Wednesday’s council session over, City Manager Peter Troedsson answers a reporter’s questions. Thanks very much for the big raise, but it’s too much. That essentially is what Albany City Manager Peter Troedsson told the city council Wednesday. Troedsson is completing his first year in the job, and the council had given him a very positive review a couple of weeks ago. On Monday council members agreed to raise his compensation 12.5 percent, based on his performance plus a comparison with the salaries of similar jobs in other Oregon cities. 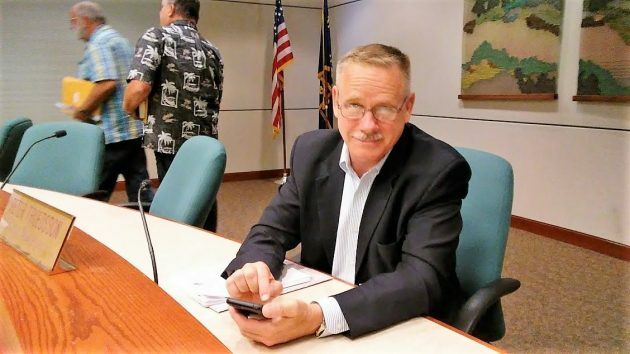 At the end of Wednesday’s city counccil session, Troedsson spoke up and thanked council members for the confidence they had expressed in him by approving such a generous raise. But he referred members to earlier budget presentations that highlighted the city government’s money issues, particularly the inadequacies of reserves. He asked that his raise be shaved back to 7.5 percent. That would be more in line with a customary step increase of 5 percent and a cost of living adjustment of 2.5 percent. He also suggested that the difference, instead of being paid to him, be used to bolster the city reserves. The council went along and approved his request by a unanimous vote. Wednesday’s meeting was short and otherwise routine, and when it was over, I asked the manager what this change meant in terms of dollars. He whipped out his phone and tapped out some calculations. With the raise reduced, his annual salary comes to a little more than $164,000. And the city’s reserve fund will have about $7,500 more. How refreshing to see someone in government who can see the forest from the trees. The taxpayers (and voters, hopefully) of Albany need to get rid of the city council and mayor when they are next up for election. They didn’t bat an eye at giving the city manager a 12.5 percent raise. Thank Heaven for the good sense of the city manager to refuse a raise of that size. Agreed. If you keep putting them back in the insanity will never stop. A very nice gesture by our city manager. But should it have been necessary? Should the city council really be giving out 12.5% annual raise? Perhaps they could baseline that compared to the average Albany residents. And thanks City Manager Troedssen. You may not be aware that from a compensation standpoint, Peter has been *woefully* underpaid — and not even close to parity with surrounding communities. When a town next to us with 1/3 the population is paying more, something is upside down. And don’t cry and whine that all the communities are over-paying their city managers. BS! When you have the background and modicum of experience to step into the arena – go for it. We knew we were going to try and get Peter to at least mid-level for compensation – we did – unanimously! That Peter came back and said “…too much-too soon-I have a better idea…”– does show his leadership skills — and one of the reasons we will get him to parity in the next couple of years! How many times have we seen a quarterback have one good year, only to see an owner lose his mind when it comes to compensation? Or a college coach the same and they throw the entire world at him for fear “we’ll lose him!” Only to see time and time again they often turn out to be a disaster. Why is the best college baseball coach in the country still in the little Podunk town of Corvallis, OR? Because he’s an Oregonian; he loves it here; and he’s not just about the almighty dollar. Because believe me, OSU couldn’t even come close to compensating him what the big boys could. He turned down the Texas job. They offered more money. If chasing dollar signs are all some care about, let them go. You’ll be better off in the long run. Mr. Troeddson is paid $164,000 a year. He just received a 7.5% raise after one year. He’s now making $176,300 to run Albany, OR. There’s probably some pretty good perks that come with it as well. I would say that’s being fairly compensated, Ray. Maybe you only see the world through tax collections instead of profit margins. Maybe in 3 or 4 years he will prove himself. No one does in a year. Not even quarterbacks and coaches. And I don’t know what community you’re talking about, but I lived in Lebanon for 25 years. There’s a reason I don’t anymore. And again, kudos to Mr. Troeddson. That roughly $164,000 is after the raise, as the story I hope made clear. Thank you Peter Troedsson for generously showing your care for our community and having a plan to put the money where you knew it was needed. I am not a resident of Albany and would not presume to tell the residents or their city council what to do. I have been on the executive committees of several not-for-profits, as a city government should be, and recognize the pressure to keep executive positions properly compensated. The market place for good executives is strong. Raiding by competing organizations is rampant. Given my experience, I would not fault the council for recognizing Mr. Troedsson for the value he has brought to the city. I think their appreciation was recognized by Mr. Troedsson and he reciprocated. This is how good relationships are cemented and a future is made to look promising. Good job, you folks !